Hello friends, I'm writing this post on special requests of my readers. I received many requests from my readers to publish the complete post/tutorial on how to submit blog links to bing and yahoo webmaster tools manually. This thing basically comes when you had already added your site to bing and yahoo for indexing your blog in search results and also submitted sitemaps to bing and yahoo webmaster tools. So, they can crawl your website. We are basically doing this manually search engine submission or bing search engine submission to get more and more organic traffic from these search engines. As you know traffic is the life line of any blog or website. After you create free blog with blogger or WordPress the first thing your would be thinking about is how to get traffic on blog or how to increase traffic on your blog. 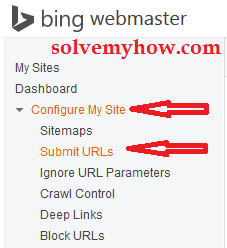 So, lets learn how to submit blog links to bing and yahoo webmaster tools manually. If you have not performed the above two steps then please do. Just Create blogger Sitemap For Blogs and submit it to bing and yahoo webmaster tools. We are doing this site submission to get faster indexing in bing and yahoo search engines. Because it usually happens that though you've submitted your sitemap to bing and yahoo. Still your post would not indexed on time. So, in this case we have to do manual search engine submission. Note :- You do not have to submit link to yahoo separately , bing link submission is enough. Your blog posts will automatically indexed in yahoo search engine. Step 1 :- Copy the below code and replace "solvemyhow.com" with your blog's URL. Step 2 :- Paste it in new tab of your browser's address bar and press enter. Step 3 :- You will receive one "Thanks for submitting your sitemap" message. See the snap shot below. Note :- The above code will index your blog in bing search upto 500 posts only. In case if you have written more than 500 posts. Then perform the above 2 steps as it is, for the code written below. If bing still fails to index your blog in bing search on time. Then the 100% solution to index your blog on time is to use bing webmaster tools and submit URLs manually. Step 1 :- Login to Bing Webmaster Tools (my sites page) and select your site. Step 2 :- Go to Configure My Site >> Submit URLs. Step 3 :- Add your blog post URL in Submit URLs and click on Submit. These are the limitation by Microsoft bing. But, congratulation you just did free website promotion. Now, your blog posts will index faster. I would also suggest you to add blog to Google and also submit blogger sitemap to Google Webmaster Tools to get traffic from Google search engine. Learn SEO and try to improve your blog's search engine optimization to continuously getting traffic on your blog. The ping method seems to be used to add sitemap and not a "specific post's url" and the "submitt url" function is working only for rooted websites/blogs (i read it in bing webmaster tool guide) isn't there another method ? Thanks for dropping by and commenting. Mark you can also use "submit url" for submitting your urls even though they are not rooted. Kindly try it once. It will really help you to index your blog post faster. Else there is no other way to do this buddy.